I’m currently thinking about how I can adapt my HIST101: Foundations of European Civilizations Part 1 course when my university’s new Core Curriculum plan rolls out in the fall. As I think about the projects that have worked, or not had the outcomes that I wanted, I looked back to my first year of teaching this course for inspiration. 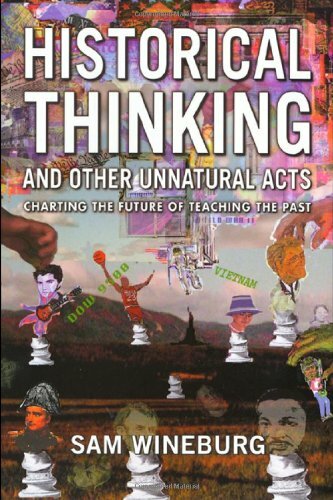 Here is what I thought, back in 2012, as I participated in my Ph.D. residency colloquium and taught my first college course, World Civilizations: “Sam Wineburg’s Historical Thinking and Other Unnatural Acts was the most influential and interesting book that I read not only during my residency year but probably in my entire academic career.” Wow! Big claims. I need to revisit Wineburg’s book soon and see how this holds up. As a resident in the program, I had no intentions to teach full-time, and instead I planned to enter the public history field on the ground, which I did. Now, however, I’m back in academia, teaching 101, public history courses, and even a graduate course. The author approaches several questions I have wondered about both in my studies and in the beginning of my residency such as why people study history at all, what history can teach us not just about the past but about humanity and ourselves, how history should be taught, and what exactly history’s place is outside of the classroom. Wineburg’s analysis of how people learn, and how history has been taught in the past is enthralling. Additionally, the questions he asks, such as why to study history and what students should learn from their history classes, were intriguing and thought-provoking, I taught my first class in a “traditional” classroom. I wish that I had read this book a lot sooner, as both an educator in museums and historical sites, and as a new teacher of college-level survey history. I love looking back at my old work (even though sometimes it is cringe-worthy), and I can’t wait to re-read Wineburg. I hope time hasn’t spoiled him for me!